Chester City Council were invited to carry out an Audit of our 'Disability Access' to comply with the new Act. Graham Garnett (now of CWaC) submitted a report Sept 2005 . He returned in 2013 and congratulated us on resolving many of the issues and understood that certain issues can only really be addressed when major refurbishment is underway. However he did draw our attention to the need to carry out further work as soon as possible. The significant area of non-compliance related to the disabled toilet and much of this will be addressed during 2013/2014. See conclusions of 28 June 2013 review . - The door to the disabled toilet is now locked with a RADAR key. Because the toilet also houses the baby changing facility its access is permitted using the Hall's RADAR key held by the caretaker - available via prior arrangement. - Wheelchair access has been improved for the kitchen fire exit by widening of the door and establishing a ramp. Access via the new side door to the Meeting Room was also designed to facilitate wheelchairs. The only user area now without wheelchair access is the stage. - Decoration and choice of doors has ensured an adequate differential for partially sighted users. 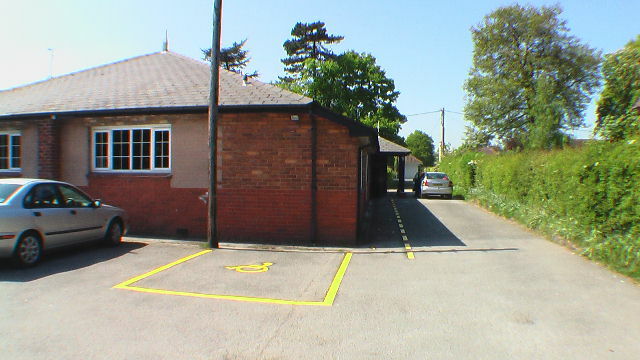 - carpark allocation for disabled access and designated access route into main entrance. A 2nd parking space is marked on the other corner with easy access into the side kitchen access (that can be held open by a hook.